Thank you, everybun for checking in yesterday. We do appreciate it. Rough day yesterday, with Suzy passing so unexpectedly. The day started pleasantly enough, with a call from the tar pits at 7 in the morning. One of the tar processors went cold. Hoomin jumped into overdrive, meaning he fed me and cleaned up around me first. Then spend the morning working on the smelly tar bugger and got it all good and boiling again. Yey, giddy up! Next news about Suzy. M*nd*y started looking really good from there. Got my weekly bum baf. Quick and easy, bum blow dry went fast. Hoomin snrugled the daylights out of me. Head rubs, belleh rubs, extra SARx treats, and a nap. Knock on wood - we'll keep you posted. And snurlgle your bunnehs. I now live for the snurgle. Thank you both for your life transforming advice and other life transforming stuff. I'm all in for this Snrugle ... as in "... Snrugled the daylights out of me." 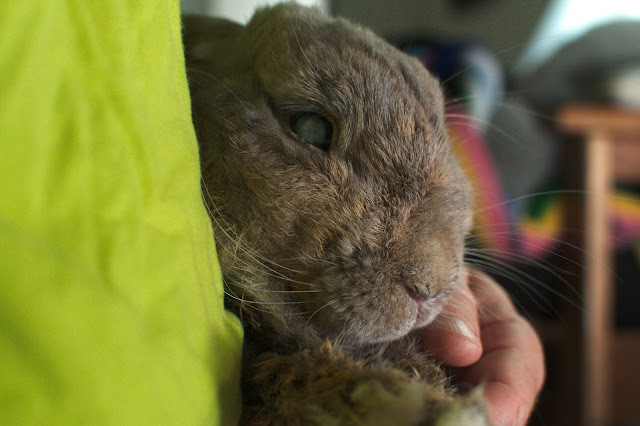 Hoppy 4th Gotcha Day, Mikey!! !